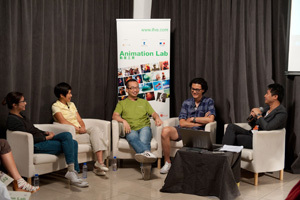 In 2011, ifva worked with the world-renowned animation school GOBELINS l’école de l’image of France, which has nurtured numerous outstanding animation artists for more than 30 years, to bring us screenings, seminars, a master class and an unprecedented chance of studying abroad in its facility. 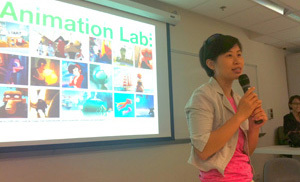 Animation Lab is your animation event of the year! 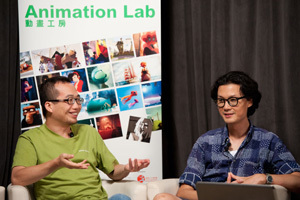 In its continual effort to bring together local animation community, ifva has arranged a series of programs that allow professional animators that worked and studied overseas to share with local fans and professionals their experiences abroad. Hong Kong-born Albert YU Ka-ho had worked as a Senior Technical Director at Bluesky Studio in the United States, where he participated in the production of Shrek, Ice Age and Rio, etc. 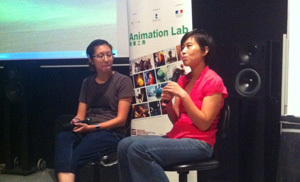 Together with director of the McDull series Toe YUEN Kin-to, who had also directed CJ7: The Cartoon, will have a dialogue with Animation Lab scholarship winners Katherine LUK E-puiand Nancy LAI Hiu-sin, these artists will share with audience about the differences between local and international animation. In having ventured overseas, these artists’ experiences will provide audience with a broader perspective on various animation production practices. The webcasting was successfully held on 26 / 08 / 2011. Participating schools: the Hong Kong Polytechnic University, Hong Kong Institute of Vocational Education (IVE), City University of Hong Kong, Hong Kong Design Institute (HKDI), Hong Kong Baptist University etc. GOBELINS has been nurturing the next generation of animators for the past 30 years and many of its graduates have gone on to become important figures in the international animation scene. Many technically accomplished and challenging animation works from around the globe, including works by students and graduates of GOBELINS have been showcased during the ifvaFestival in March 2011. Some of them had even been nominated for the Oscar’s Award, included such outstanding works as Oktapodi, French Roastand URS, as well as Fard, the winning short at the International Short Film Festival at Clermont-Ferrand. Eric RIEWER from GOBELINS has been an important spokesperson in the world of animation. Mr. RIEWER inspired and entertained the audience during his lecture held in the agnès b. Cinema at the Hong Kong Arts Centre on the subject of future trends of world animation. His talk encompassed a wide range of topics from the creativity of GOBELINS students and their skills to his colorful and manifold experiences meeting animation professionals from around the globe. 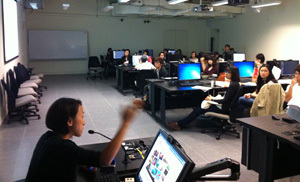 Many participants took the opportunity to probe Mr. RIEWER on how to gain entry into the international animation scene. For one afternoon, the agnès b. Cinema became a stage for international animation exchange. GOBELINS has always challenged students to think outside the box. Rather than asking students to sit in front of the computer, Master Class instructor Robert BENNETT, a world famous mime artist, took students out onto the roof of the Hong Kong Arts School, where they struck various poses and learnt about the art of mime. This gave students insight on how to design movements and expressions for their characters. Once back in the classroom, DreamWorks animator Pierre PERIFEL lead the class in observing everyday details and conceive character identity and motivation so that students can create animated characters that are coherent and true to life. Two students from the Master Class were deemed to have sufficient potential to be selected to participate in the GOBELINS Summer School. Katherine LUK, lecturer at the School of Design at the Hong Kong Polytechnic University and animation student Nancy LAI were the lucky joint-winners of a HK$80,000.00 scholarship that includes full tuition, room and board and airfare subsidies. They took off in July 2011 to France to attend a two-week animation course at the GOBELINS Summer School, where instructors included Kyle BALDA, who used to work at Pixar Studio and was behind such smash hits as Toy Story 2 and Monsters Inc. and Alexandre HEBOYAN, who worked on Kung-fu Panda. Outside of class, the two took in the Parisian scenery and had their fill of the best that French culture and art had to offer, and returned to Hong Kong with fresh inspiration for their future works!